For the past few months opening an Office 2007 document (Word, Excel or Powerpoint) from Windows Explorer on all of my Windows 7 machines took over a minute. Opening the application alone was instantaneous and opening the same file from within the newly opened application was immediate. Since the application opened quickly, I guessed the reason for the slowdown was related to Windows Explorer. The most common solutions I found were to disable DDE (Dynamic Data Exchange) using the File Types section of Folder Options in Windows XP, but Microsoft got rid of the File Types section in Windows 7. The registry entries are still there, but it’s a pain to find them all. I used FileTypesMan from Nirsoft to remove the DDE message entry and replace /e with “%1” but then the application opened without opening the file. Process Explorer showed that it still had the /e argument and no filename (the %1 should be converted into the filename). When in doubt, it’s always best to use the source. In this case the source was the registry, and FileTypesMan has an option to “Open Action in Regedit” (Ctrl-E) where I saw this strange-looking entry. It explained why /e was still being passed to Excel. I renamed the key from command to __command and the problem was solved. For each file type’s default action (typically Open), delete the DDE message value and replace /e with “%1” (be sure to include the quotes), then rename (or delete if you dare) the REG_MULTI_SZ command entry and your files will open like greased lightning. 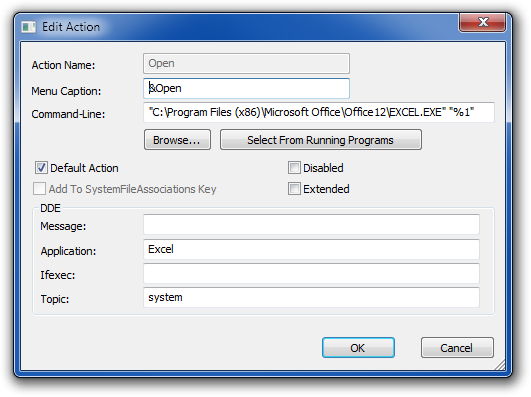 Update 7 Sep 2012 16:42:26: If you get this error: There was a problem sending the command to the program try disabling the “Ignore other applications that use Dynamic Data Exchange (DDE)” options in options as described here.